The Bear River Meditation Group follows the Zen Buddhist practice of Serene Reflection Meditation (Silent Illumination). We are affiliated with Shasta Abbey Buddhist Monastery, and the Order of Buddhist Contemplatives. The order was founded by Houn Jiyu Kennett following her training at Sojiji Temple in Japan. The meditation group is led by two licensed Lay Ministers, Andrea Spark and Pam Johnson, and has been in existence for nearly 25 years in the Auburn, California area. All are welcome to come to the meditation group meetings and retreats. Meditation instruction is offered for those unfamiliar with our form of meditation. The views/ideas/teaching expressed here do not necessarily represent those of the Order of Buddhist Contemplatives as a whole. 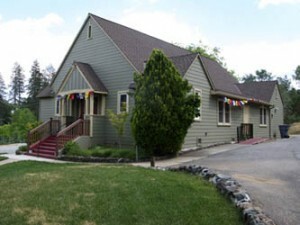 The meditation group is located in the foothills of the Sierra Nevada Mountains in Northern California. We meet at the Applegate Community/Civic Center, 18014 Applegate Road, Applegate, California. Go to the Contact page for a map. The community center is a rejuvenated one-room schoolhouse next to the Applegate Library. Please check this site for more information on specific meetings, scheduled visits by monks, and topics of Dharma discussions. We meet regularly on Monday evenings from 7 p.m. to 9 p.m. These weekly meetings usually include recitation of scriptures, meditation periods, Dharma discussion and tea. Retreats, led by Senior Teachers of Buddhism are held on Saturdays or Sunday afternoons. Please see the section on Retreats for announcements on coming retreats. The meditation group is directly affiliated with Shasta Abbey Buddhist Monastery. Senior monks of the Order of Buddhist Contemplatives come to the meditation group monthly to give Dharma talks, lead ceremonies and retreats, and offer spiritual counseling. Meditation group members also attend retreats at Shasta Abbey, visit other temples of the Order and host visiting monks in their homes. The meditation group exists on the ancient Buddhist tradition of dana, or what we know of as ‘generosity of spirit’, the giving and receiving from heart to heart. The practice of dana dates back 2,500 years to the time of the historical Buddha, Shakyamuni. The Buddha in His wisdom purposely set up a practice of direct interchange and interdependence between the monastic and lay Sangha. He foresaw that reciprocal respect and kindness would develop between members of the Sangha in following the practice of dana, which in turn would assist each one of them in bringing their training to fruition. Whether we live the homeless life of monks or the life of a householder, generosity makes the heart grow brighter. There is no charge for attending the weekly meetings, nor for the events we sponsor. But, please keep in mind that we do pay rent to the Community Center, make offerings for our teacher’s transportation, provide tea and treats for weekly meetings and retreats and purchase supplies such as meditation cushions, benches, mats, candles, and incense. Donations are greatly appreciated and help support the continued activities of the meditation group. The Order of Buddhist Contemplatives counts 85 Masters in our ancestral lineage, beginnig with the historical Buddha whose teaching of the origin of suffering and the path to it’s cessation flourishes today in the West. This lineage includes Bodhidharma who brought “wall-sitting” to China and the Shao Lin Temple, the 6th Chinese Master Hui Neng, and Dogen, who journeyed to China in the 13th century and returned toJapan to found the Soto Zen practice and Eiheiji Monastery in 1246. The Order of Buddhist Contemplatives was founded by the late Reverend Master Jiyu-Kennett, an English woman, who was ordained in Malaysia in the Chinese Buddhist tradition. She went on to study in Japan where she eventually was certified as a roshi, and was authorized to teach and ordain men and women as monastics in the Soto Zen Tradition. This meditation group and those who practice with us follow the teachings of Soto Zen (Chinese: Ts’ao – Tung Ch’an) as passed on by Reverend Jiyu-Kennett. This practice is known here as Serene Reflection Meditation. The Order of Buddhist Contemplatives is committed to providing a safe and ethical environment in which all may practice. We expect that we, and those who come through our doors, will treat others preceptually and with respect. We value the harmony of the sangha, and wish to address any concerns that may arise about possible unethical or inappropriate behavior. If you should have such a concern, you should feel free to discuss it with the priest of your or any OBC temple, any senior member of the Order or lay minister. Temple contact information can be found on the OBC website.